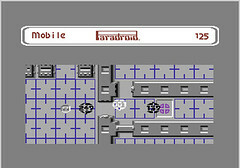 Paradroid is a game by Andrew Braybrook that was originally released for the Commodore 64 in 1985. Yes, I am writing a review of a 22-year-old game. Yes, this retro-review deviates a bit from standard Arthouse Games practice. I justify this deviation with the following two excuses: 1. I never played the game when I was a kid, so it's new to me (and probably new to many of you, too); and 2. there's very little modern grist for the Arthouse Games mill (art games are few and far between). That said, I'm not sure that Paradroid is an art game---more like an interesting landmark in the art of game design. Okay, first things first: how can you play it? Paradroid was re-released as Paradroid 90 on the Atari and some other platforms. It has a few modern remakes for PCs (see http://paradroid.sf.net, http://paradroid.ovine.net/, and http://freedroid.sourceforge.net/). All of these remakes differ slightly from the original in graphics or gameplay, but they're probably the easiest way to get a taste of Paradroid on a modern computer. This review covers the original 1985 version for the C64---you can download a disk image of that here: paradroid.zip. I played it on the VICE emulator, and I had to download C64 system ROMS separately (from this package), since they no longer ship with VICE for legal reasons. I unzipped the paradroi.d64 disk image, mounted it as a disk in VICE, and auto-started the program on the disk. 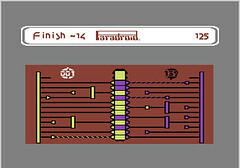 I had a bit of trouble here and there along the way (Paradroid is looking for a joystick---or emulated joystick---on port 2), but I was able to get Paradroid running smoothly with a bit of perseverance. If this process sounds too involved, try one of the remakes linked above. Like many ancient games that have a bit of depth, Paradroid's gameplay is not self-evident. I found myself confused at first, but reading this manual cleared up that confusion. Why don't we need manuals to play most modern games? That's an interesting question that I won't delve into here. But I encourage you to jump into the time machine for a bit and read the manual---imagine that you're in 1985, and it won't feel so weird. For Paradroid, the necessity of the manual stems partly from the fact that its mechanics are quite different from any other game that I've seen. The droids have gone haywire on a space freighter, and you must quell the mechanical mutiny by deactivating all of the droids on the ship. You command an Influence Device, a weak droid that can take control of other droids. You can shoot droids to destroy them, but the lasers on the Influence Device are useless against many of your more formidable opponents. Each droid on the ship is labeled with a class number from 1 to 9, and higher class droids are more powerful (your Influence Device is class 0, at the very bottom). When you take control of another droid, you can leverage that droid's assets, including its armor and weapons, to destroy other droids. If the droid you are controlling is destroyed, you revert back to your measly Influence Device, and if that is destroyed, your game ends. A side-view map of the ship's deck and elevators. The exploration and destruction portion of the game is not particularly noteworthy. The ship has a network of 20 decks connected by elevator shafts, and you can freely roam throughout the entire ship right from the start. While on a given deck, you see a top-down view of the chambers and corridors. As you move around, you can fire lasers at other droids, and they can fire back at you---a rather standard, shoot-em-up affair. The droid-takeover part of the game, on the other hand, is what makes Paradroid still worth talking about 22 years later. To control another droid, you first switch your current droid (which may be the Influence Device or may be another droid that you're already controlling) into transfer mode and then run into the target droid. You are then shown a description of your current droid and the droid you are trying to control, complete with cute C64 pictures, before the view switches to the transfer mini-game. In the mini-game, you fight with the other droid for control over power channels in a circuit diagram. One side is yellow, the other side is purple, and there are different circuits on each side. You get to pick your side (and circuit) at the start of the mini-game. Then you and the opponent droid simultaneously move to apply power pulsers to the wire leads on your opposing sides of the circuit. When one of your pulsers connects, through a wire path, to the center bar, one block of the center bar changes to your color. The goal is to have at least 7 of the 12 center blocks switched to your color by the end. Did I mention that you only have a limited number of pulsers to apply? Did I mention that there is a tight, 10-second time limit before the circuit locks up and a winner is determined? Each pulser only applies power for a brief time, so if you apply power to a given center block after your opponent does, your opponent's pulser will expire first, and the block will switch to your color. Thus, there is a cat-and-mouse feel---you wait for your opponent to move first so that you can foil its pulsers, but the clock is ticking, so you can't wait too long. The result is a brilliant mix of white-knuckled, reflex-based action and light strategy, all in a 10-second mini-game. The other interesting thing about Paradroid is how well this mini-game fits in with the rest of the design. The class level of a droid determines the number of pulsers that the droid can deploy during the mini-game. Your Influence Device has only three pulsers, whereas a class 2 droid may have five, and a class 9 droid has many more. Controlling a circuit with only three pulsars when your opponent has 10 is practically impossible, despite whatever strategic advantages you might leverage through your choice of circuit side or pulser placement. Though your class 0 Influence Device does not stand a chance at controlling a class 9, you can easily beat a class 9 with a class 8. Thus, to eventually control high-class droids, you must work your way up the class ladder. A similar mechanic, at least in terms of end result, is found in many of the standard game genres---you must defeat weaker opponents before becoming strong enough to defeat the more powerful ones. You must kill sewer rats before you can tackle skeletons. You must defeat the [blank] and obtain the [blank] if you want to stand any chance of beating the [blank]. But the implementation of this "character growth" mechanic often feels contrived and out of place in the game world. What exactly is a "level 5 sewer rat" anyway? In Paradroid, the character growth mechanic fits with the rest of the game beautifully. When you defeat an opponent in the mini-game, you gain control of that droid, so it makes sense that you suddenly gain new abilities. Furthermore, the outcome of a given mini-game cannot be computed from opponent statistics alone---your bare wits also come into play. Once you get the hang of the mini-game strategy, you can start to make gambles---should you try to beat a class 3 with your class 1, or play it safe by challenging a class 2? If your gamble pays off, you'll get to skip a rung in the class ladder, but if you fail, you'll be back to class 0 and suddenly quite vulnerable (especially if you happen to be in the vicinity of lots of high-class droids with powerful lasers). Imagine an RPG in which, during a combat encounter with a sewer rat, you played checkers against the rat. Sure, it seems a bit out of place in the RPG game world, but it certainly would be more interesting than the standard fair (you swing for 3 damage, the rat gnashes for 1 damage, you swing for 3 damage, the rat gnashes but misses, you swing for 2 damage, the rat collapses, you win). Give higher-level characters more checkers or extra moves per turn, and you'll have a mechanical embodiment of character levels. You'll have what Paradroid had back in 1985. Of course, you can tweak your strategy mini-game so that it fits your theme better---maybe more like chess, where each piece represents one member of your party; heck, maybe even like Disgaea. Paradroid's mini-game is themed perfectly: you're competing for control of a circuit in a droid's brain. To summarize: combat encounters don't have to be brainless, button-mashing affairs or soulless, number-crunching drudgery. That design lesson aside, Paradroid is still fun and addictive, which is unusual for a game of its vintage. It's certainly worth figuring out if you've never played it before, and it's also worth revisiting as a design milestone---a nice find, for sure. 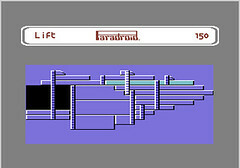 First, I actually had missed Paradroid back in the C64 days. Thanks for the suggestion. Nice writeup! I remember playing a lot of Paradroid back in the day. One thing I didn't like about the game, however, is the harsh penalty for failure in the minigame. If you fail a takeover, you're instantly back down to Droid 001, and at perilously low health to boot. Just a little bad luck at the transfer game and you're suddenly surrounded by 700 and 800-class opponents, and basically one hit away from Game Over. Not fun. Further, it took me ages, but I finally managed to clear the first freighter. When I found out successive levels had the same map as the first, I was underwhelmed to say the least. For the last 8+ years Ive been trying to remember what that game I used to play as a boy was called. I would type some stuff into what ever search engine was popular at the time but always came up empty. Thanks to you my search is over. Damn that was a hard game too. Don't think i ever beat it. Then again I was young and impatient. Now where did that emulator i have go to. As an interesting anecdote, the mmorpg Neocron, set in a tech futur a la ShadowRun, reused the *exact* same circuitry minigame for it's "hacking" skill. Funny how good ideas get recycled all the time. Great to see someone enjoying this game 22 years after its release. I played it a lot when it first came out and it was a great game on the C-64 back in it's day, largely due to it's original, unique and addictive gameplay. Your review makes me feel like leaving my pixelated kevlar and assault rifle in the locker tonight, and giving this old classic a spin. While the minigame is definitely a key feature of Paradroid, the article doesn't mention how smooth the motion and scrolling was. The mini-game description reminds me a bit of Archon, where you actually play some kind of chess with pieces with different abilities. In Archon you also had the possibility to 'soften' up your target, e.g. by repeatedly throwing pawns at the opponent's 'shapeshifter', practically guaranteeing a victory after a few fights (even when the shapeshifter started out with much more hp then a pawn has in the first fight). Just discovered Cultivation.. found this blog and what do you know.. your reviewing Paradroid, which I did play on the C64.. great great game. Just thought I would point you in the direction of my Creative Object World (cow) http://www.creativeobjectworld.com which is nothing like paradoid.. but fun none-the-less. Actually you could re-do paradoid in cow if you had the mind to learn CowScript.. but being text-absed it wont be quite so exciting. Actually had to disagree with this "there's very little modern grist for the Arthouse Games mill (art games are few and far between." They're out there, just hard to find. Of course, as you've discussed already on the site, it depends on your definition of art. But one great site is SelectParks (http://selectparks.net/), which you might be familiar with. Also, I've written a few posts recently on meaningful games and games pushing for for new aesthetics and new mechanics on Window (http://window.org.nz/).